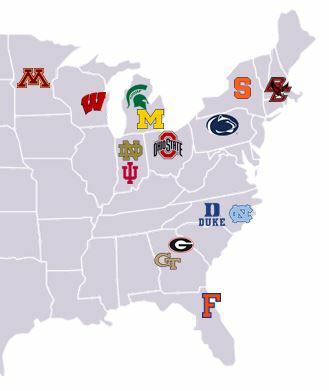 Starting with the fall 2015 semester, Delta will launch alliances with nine universities across the country that go beyond traditional stadium signage to embed the airline and its employees in campus and alumni events, academics and career recruiting and counseling, all in an effort to become a lifelong travel partner to future customers. By employing a team of college seniors, Delta has gained direct insight into the needs of its next generation of customers. Students’ feedback following an eight-week intensive internship at the airline’s Atlanta headquarters formed the foundation for Delta’s groundbreaking approach to university partnerships. Delta’s new university partners include: Duke University, The University of Florida, Indiana University, University of Michigan, Michigan State University, University of Notre Dame, The Ohio State University, Penn State University and University of Wisconsin. The airline has existing partnerships with Boston College, Georgia Institute of Technology, University of Georgia, University of Minnesota, University of North Carolina and Syracuse University. Delta employees providing hands-on help as 10,000 freshmen arrive for Michigan State Sparty Move-In Day Aug. 30. Delta employees will offer luggage carts, refreshments, and complimentary care packages to help students settle into their new digs. Lighting up the Delta Celebration Grill, built by the Delta Technical Operations team to look like an aircraft, at select football season tailgate parties for SkyMiles members and those who sign up onsite. Tailgates will feature College Football Legend appearances, a social photo capture and sharing hub, lounge space with feeds of college football games and more. Delta being front and center for Midnight Madness and the start of the 2015-16 college basketball season at universities such as Michigan State and Duke. Partnering with local alumni association chapters to participate in football watch parties with food and beverage specials and premium branded items for SkyMiles members. Participants will have the opportunity to win trips to a home football game during the 2016 season. The campus events reflect feedback the airline gained from interns this summer. In addition to on-campus events and activities, Delta will support select students for study abroad or alternative spring break travel, allowing students to participate in volunteer activities worldwide. Details of this program are to be announced. Delta also will be on campuses showcasing the benefits of a career with the airline while also providing valuable career path lessons to students. While Delta’s unique approach to this university audience has been informed by the students themselves, media partner, LinkedIn, provided insight on connections between the airline’s existing corporate customers and the colleges and universities from which they graduated. That information helped the airline prioritize which universities to approach. In addition to programs launching this fall, Delta is exploring ways to continue to reach beyond athletics with opportunities to complement academics with events such as C-level executive summits at select schools and more robust on-campus recruiting programs.